Кратко. Первое – все модели совместимые с P3DV4.3 должны без вопросов летать в P3D V4.4, проблем быть не должно. Второе – PBR, как многие уже догадываются пока не будет применим, по понятным причинам, нужно время на переделку моделей и т.д., плюс пропадёт обратная совместимость с более старыми версиями P3D. Будут думать. Третье -сейчас команда активно занята предстоящим обновлением PMDG 747 Queen of the Skies II, это не связано как-то с P3D V4.4, просто рабочий момент. Третье – идёт работа над NG3, подробностей нет. И ещё скоро собираются переезжать на свой новый форум. Всё. MDG 747 Updates: We are currently wrapping up testing of a new update for the PMDG 747 Queen of the Skies II product line, and we are hoping to push this update to you via micro-update in the days ahead. It is a pretty comprehensive update with quite a few feature improvements, efficiency enhancements and even some cool new features that we haven’t shown you yet. I thought we would likely push this on Friday this week, but I am less confident in this schedule at the moment- so most likely it is looking like early next week instead. When we actually make the push, I’ll have more information for you about what it is, what changed and where we are headed with the 747s in the next round of updates. 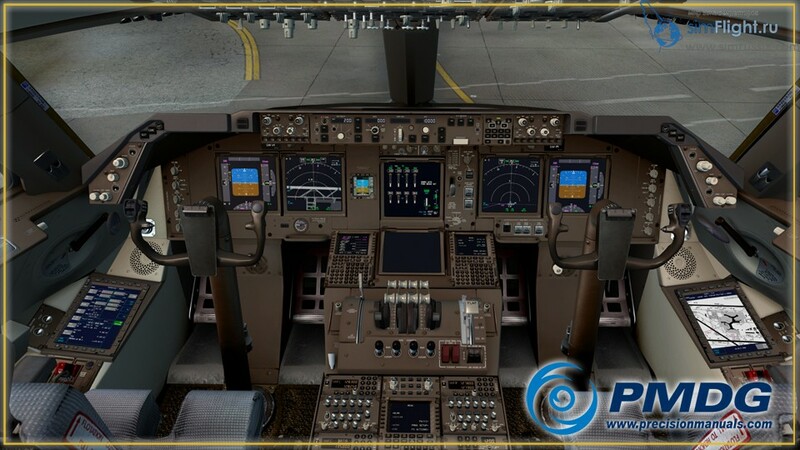 Prepar3D v4.4 Compatibility: You should have no issues with forward compatibility in any PMDG product currently working in Prepar3D v4.3. It is very important to us that we not obstruct your forward progress in minor version updates of Prepar3D, so we do not inhibit the airplane from running with a new version. Such inhibitors are untidy and rather unfriendly- and haven’t proven to be necessary in any regard- so if you want to move to P3D v4.4 you won’t find any problems on our end. Prepar3D v4.4 PBR Updates: While everyone is obviously excited about seeing PBR applied to all of our products- this will take a bit of time and we will roll them out on an “as ready” basis. There are no ETAs on this as the dev team is quite heavily engaged in NG3 development, along with a few more major changes in the 747 product line as it currently stands. While we have been watching the PBR update coming through the testing process- documentation was not ready on it’s proper implementation so we elected not to invest time in getting a jump-ahead on it because we wanted to see what the final version looked like before investing the time. I do want to be really specific on one point: When we roll out the updates for each product to make it PBR enabled in Prepar3D v4.4, we will be moving the “required version” to v4.4. If you wish to remain with P3D v4.0-v4.3 for some reason, you are best advised to make sure you don’t install any updates after we move the requirements, as they will not be compatible with versions earlier than v4.4. You will lose the ability to enjoy any forward updates as we will not be continuing to support outdated minor updates in P3D v4, choosing instead to keep our products compatible with the very latest version from Lockheed Martin. I recognize that there is some impatience in the community to see these updates- but please give us a bit of time. I have read all kinds of wild conjecture in various forums and Facebook groups regarding what exactly is involved in implementing this feature and how “easy” it apparently is to do. If you find yourself reading the same, please keep in mind that this can be done very quickly- if you are satisfied with it looking like crud. To be done well, it will take a bit of time- and we intend to take that time so that you really get a great looking result. Alright- I think that covers today’s information. For those of you in the USA, we hope you had a very nice Thanksgiving holiday- and whatever season you celebrate in the weeks ahead- we wish you all the very best wishes for the year ahead. п.с. В принципе осталось дождаться Езку и можно уже пробовать гонять на боинхах в обновленном P3D.